Last week I was gifted this Avon polish from my sister in law. She said she loved the colour but it just didn't look right with her skin tone. Whoo hoo, SCORE to me! 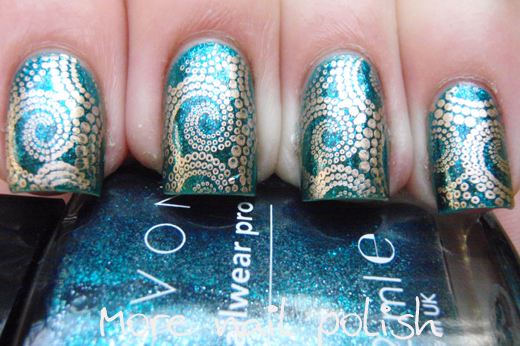 This really is a stunning glass fleck Avon polish. 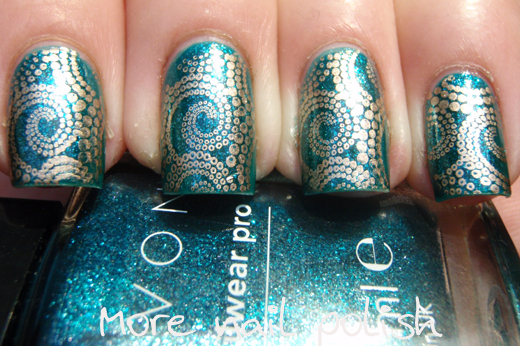 This is two coats for Avon Sequined Turquoise stamped with China Glaze 2030 using a swirly dot image from the DRK-B plate. 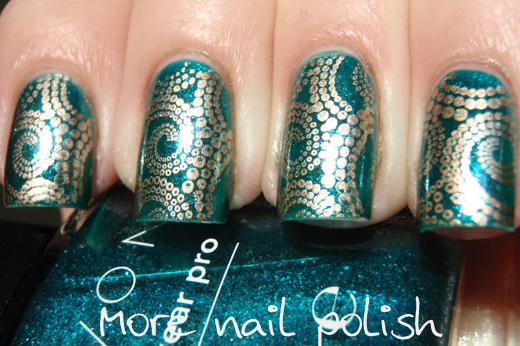 Something about this mani (and I think it's the combo of the base colour and the dotty stamping) reminds me of an octopus underwater. Here's what Sequined Turquoise looks like on its own. Wow right! 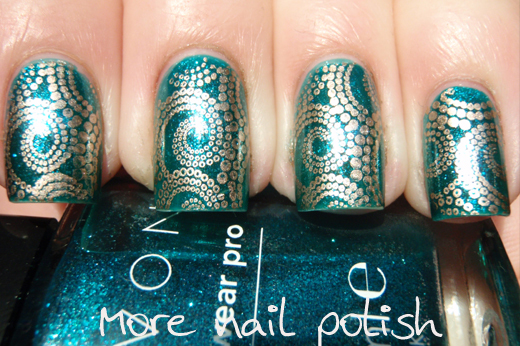 I always gets surprised by Avon polishes, I keep thinking they are going to be granny frost colours. Thanks so much Al, I love it! That's a fantastic nail polish, and totally awesome that your sis-in-law gave it to you. 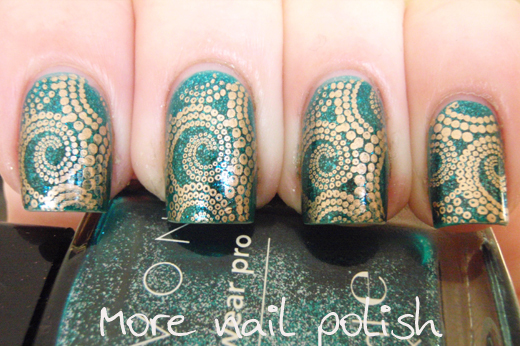 And you're right, it also reminds me of an octopus under water. Gorgeous!! This is very Bollywood - gorgeous! Love the combo! 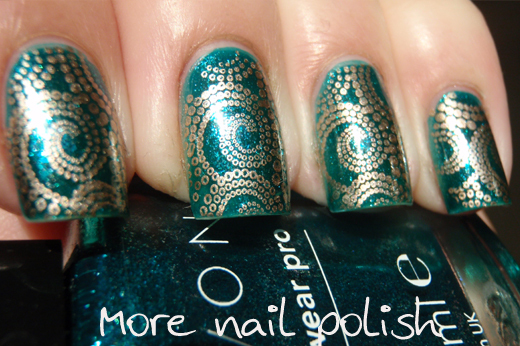 And that Avon polish is actually really nice! I love all of Avon's polishes. Ruby Slipper is one of my favorites. This looks great on you. OMG, I love it!!! 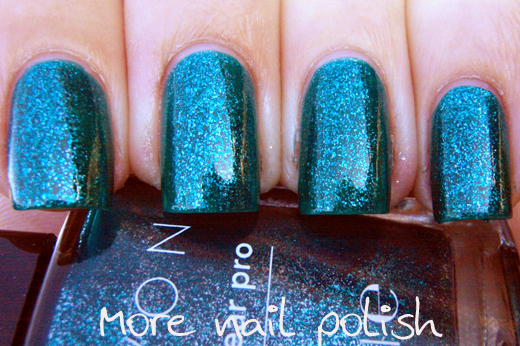 I am crazy for teal and turquoise polishes and this one is fabulous!! I wonder if I can get my hands on it! that image is cool - it looks like tentacles sorta! What a beautiful combination. Wow! This design is just stunning!